Setting out from Anamaduwa at 6.30am we saw the local Buddhist temple, passed the Catholic church and heard the Muslim call to prayer. Early morning is the best time of day for riding before it gets really hot. School children were waiting for buses, travelling by bike, scooter and tuk tuk, all in bright white uniforms, the girls with long plaits tied with ribbons. We rode along major and secondary roads today and found conditions to be favourable – the quantity and speed of traffic is moderate, road surface good and shoulder generous. This is a rice growing area with dry padi fields at present after the recent crop has been harvested. We breakfasted on tiny bananas in a small town and then stopped in Galgamuwa for a cup of tea. Here we were the recipient of the assiduous attentions of four staff members who brought strong tea, warm milk and hot water and rushed to bring top ups when the tea ran low. We are enthusiastically greeted along the way by the people we pass. Our mode of travel is pretty hard for Sri Lankan people to understand and we have had several suggestions regarding more sensible alternatives. While resting in the shade we were befriended by a group of Buddhist monks who were travelling south in a van. They had stopped for lunch and offered us a couple of the corn cobs they had bought from a nearby stall. One of the monks who had studied in Melbourne invited us to visit their centre in Polgahawela, between Kandy and Colombo. 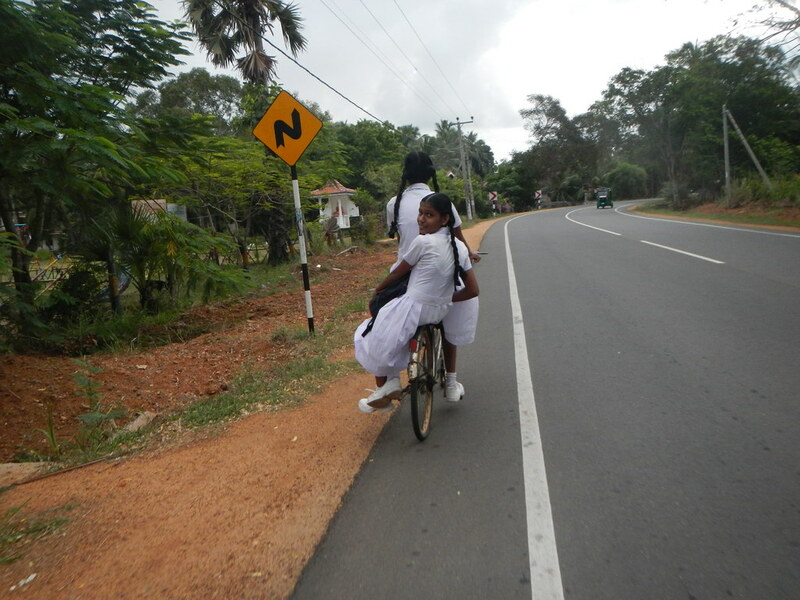 It was hot by the time we arrived in Anuradhapura – cloud cover and shade were in short supply. Our accommodation is quiet and cool. Tomorrow we will attempt to absorb culture and history. This entry was posted on 10 September 2015 at 1:34 pm and is filed under Sri Lanka. You can follow any responses to this entry through the RSS 2.0 feed. You can leave a response, or trackback from your own site. Love that you’re getting suggestions from people on alternate modes of transport.. What is it that worries them about your bikes?